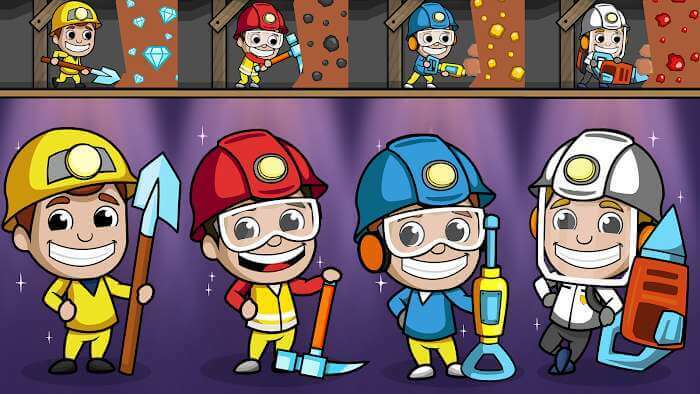 Idle Miner Tycoon – Mineral resources are a precious natural gift for us. It can be stone, iron, earth, water, metal for use as building materials, everyday utensils and even jewelry. Thus, we can understand that mining is an essential industry in today’s modern era. Although the mining work is quite hard, the profits that this industry brings extremely large. Do you want to become a developer of this industry? 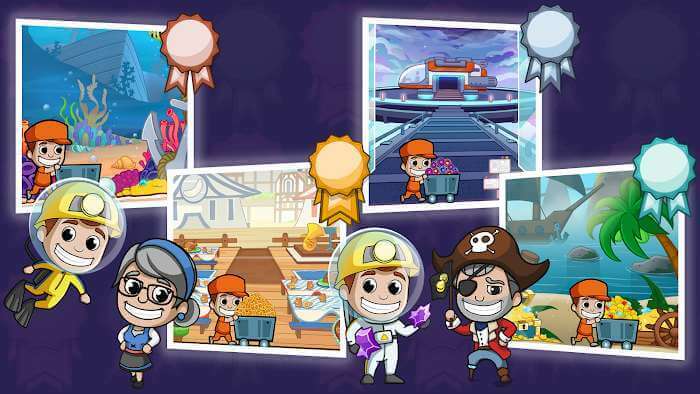 Idle Miner Tycoon is the place to show your leadership and development. Work hard and make yourself the richest person in the world! 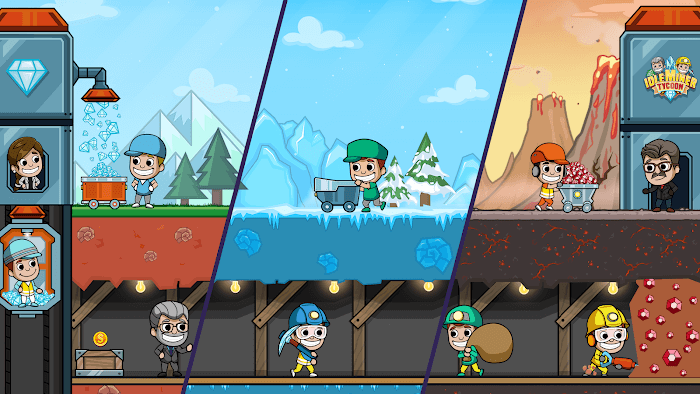 In Idle Miner Tycoon, you will become the boss of an industrial capital mining company. Your task is to run minefield operations, and everything related to the mining process. Initially, you were offered a small mine, along with a small number of workers and machines. Coordinate your workers with hard work, as you have more minerals, and you will have more income. Use that money to hire more workers, and increase productivity for your company. When you have more workers and gold coins, open new ones. Even though you have to pay much money, the deeper the tunnel, the more valuable minerals you have, and the more profitable it is. The game also provides state-of-the-art machinery to help you reduce your hiring. Upgrade them to increase productivity. However, when you have multiple tunnels, think about hiring more managers. They will manage the work in the pit and at the same time manage the speed of the workers, helping the workers work harder. There are different types of management; each manager will create different effects. With highly effective managers, the cost is very high. This game offers up to 10 mines, each with different resources such as coal, gold, ruby, lunar, purple amethyst, crystal or jade. With so many mines, you will have a hard time playing this game. However, they also give you lots of dollars if you know how to manage it. A good tip for you is to take good care of your mine until it is productive and move on to the next mine. 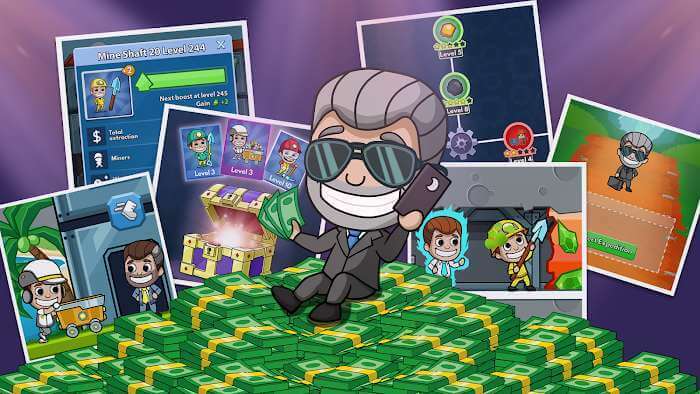 Are you ready to become tycoons manage the mining industry and become the richest yet? Download this game because they are handy, contain no ads, do not contain items purchased in real money and released entirely free. In particular, with this game, your mine will remain active when you are offline, making you more money. You also do not need a network connection, and you can experience this game anytime you want. So still hesitate, make yourself into the great mining magnate of the capital industry right now.